We are Grand Traverse Pie Catering. We are proud of the place of our original home. A land defined by the seasons, influenced and inspired by water, wind, snow, and sun. A land of bounty that goes far beyond our famous cherries. Where rolling hills shelter and nurture strawberries, raspberries, blueberries, peaches, and apples. A place of small, close-knit communities where families know and support each other. Where people are connected to each other and to the land. 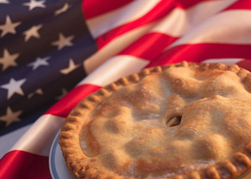 Our pies are a reflection of our deep relationship with the Grand Traverse area and its people. We are pie makers, first and foremost. Pie is a celebration of family and tradition, neatly and deliciously packaged in a flaky crust. Our passion is to re-create those memorable Pie Moments from long ago. Our bakers take great pride in hand crafting each pie and baking them slowly until they are just right. Like our grandmothers, they have the "eye for pie". To that end, we celebrate pie. Every one of us. Everyday. Our vision at Grand Traverse Pie Catering is to spread this love for pie throughout everything that we do and make at the Grand Traverse Pie Company. We are committed to using Michigan products and suppliers whenever possible, and strive to be a connecting point in our community.